When turning your eyes on Mallorca you may find a place where traditions meet creativity. The essence of the island and its people gathered in enchanting yet simple atmosphere. 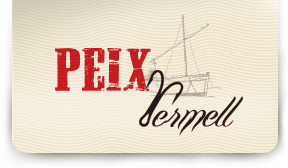 This is our concept for Peix Vermell [peʃ vərməj]. Located in the Old Town on one of the most emblematic streets in Palma, the restaurant offers a wide variety of fish and seafood. We serve fresh Mediterranean fish every day. We may offer vegetarian / vegan dishes by request. Chic and cosy Peix Vermell has 45 seats in two separate rooms. The larger one is with 30 seats and is suitable for all kind of events. The VIP section of up to 15 seats offers special atmosphere and elegance. Our team speaks Spanish, Russian, English, German. Our Chef says “Bon peix per bona gent!’ (Good fish for good people!) to make sure the long-lasting taste will leave long-lasting memories.